Designed to defeat unsheltered and covered manpower, weapons and equipment of the enemy at the forward edge of the battle area and to the regiment mission depth. The howitzer is mounted on a three-trail carriage with all-round traverse. To the raise the wheels clear of the ground, a hydraulic jack with baseplate is used. Loaded manually. It is one of the most widespread guns all over the world. There are about 3600 units in 35 countries excluding the CIS countries. It is possible to deliver the 2A18M-1 version with the semi-automatic rammer. To increase survivability the bore can be chromium-plated at customer request. 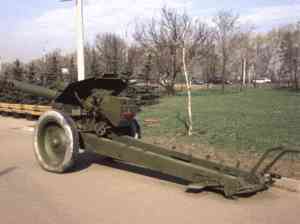 The towed 122 mm howitzer D-30 entered service with the former Soviet Army in the early 1960s as the replacement for the towed 122 mm howitzer M1938 (M-30). 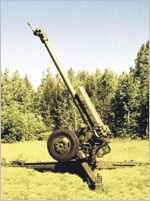 The 122 mm howitzer D-30 was designed by the F F Petrov design bureau at Artillery Plant No.9 in Sverdlovsk. The main improvements over the earlier weapon are increased range and the ability to rapidly traverse the weapon through 360°. This allows the D-30 to engage new targets much quicker than a normal towed artillery system. Late production models of the D-30 are designated the D-30M and have a number of modifications including a new double-baffle muzzle brake, a new central baseplate which is square rather than round and a towing lunette assembly. It also features modifications to its cradle, carriage and recoil system. As it is ballistically the same as the earlier D-30 it has the same range and capabilities. The 122 mm howitzer D-30 is towed muzzle first and on arrival at the battery position the crew first unlock the barrel travelling lock which then folds back onto the central trail. The firing jack under the carriage is then lowered, raising the wheels clear of the ground. The two outer trails are each spread through 120° and the firing jack is raised until all three trail ends are on the ground, when they are staked into position. The lunette is mounted either under the muzzle brake or on the barrel just to the rear of the muzzle brake. In either case it is normally swung through 180° so that it lies under the barrel before firing begins. Fire-control instruments include a Type PG-1M panoramic sight, Type OP4M-45 telescopic sight and a Type K-1 collimator. An unusual feature of the D-30 is that the recoil system is mounted over the barrel, which is designated the 2A18. Some of the projectiles fired by the D-30 are interchangeable with those fired by the 122 mm howitzer M1938 (M-30) but the D-30 also fires a HEAT (High Explosive Anti-Tank) projectile of the non-rotating fin-stabilised type. NORINCO of China has developed a new family of ammunition which can be fired by the Russian-built 122 mm D-30 or the Chinese version, brief details of these are given in the entry for the Chinese version of the 122 mm D-30. The main armament of the Russian 122 mm self-propelled howitzer 2S1 is based on the ordnance of the D-30. The D-30 is also produced in China (see separate entry), Croatia (marketed by RH ALAN under the designation of the 122 mm howitzer D-30 HR M94), Egypt (covered in a separate entry), Iraq (called the Saddam), Iran (Shafie D-30 1) and Serbia (122 mm howitzer D-30J). Russia now has available an upgrade package for the 122 mm D-30 which enables it to be towed at higher speeds, improving its reliability and enabling it to come into action more quickly. This is also referred to as the 2A18M and has a number of minor improvements including a new cradle and modified recoil system. It also features a new muzzle brake. This has been developed by the now BAE Systems, Ground Systems of the US and consists of a modified 155 mm M109 self-propelled howitzer/M992 Field Artillery Ammunition Support Vehicle (FAASV) chassis with a fully enclosed superstructure at the rear in which is mounted the complete upper carriage of the Egyptian-built D-30 towed howitzer. Details of this system are given in a separate entry. So far the Egyptian Army has taken delivery of a total of 124 systems. 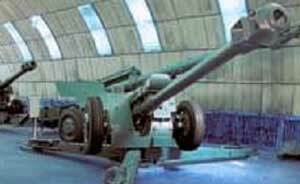 For several years China has been manufacturing their own version of the Russian 122 mm D-30 and this is known to have been exported to Pakistan who took delivery of 80 units in 2003 followed by an additional 63 units in 2004. Details of the Chinese version of the Russian D-30 are provided in a separate entry.